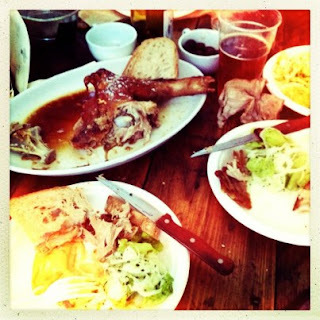 The Unthank Supper Club: Eating out is hard to do...no pun intended! Eating out for Yusuf and I is very problematic. We both love food and we can both cook. Recently at one of our gatherings a member named Dave who works at a food institute did a litmus test on all of the guests. There is nothing quite like a parlour game with a scientific end is there? At the end of this test we both discovered that we were supertasters. Which made a lot of sense, as we both have a very heightened sense of taste, and for me a super sensitive nose too. My sense of smell can be so acute sometimes it is quite hard work living in a rural agricultural farming area certain times of year can make me literally gag! SO..bearing all of this in mind we are not easily pleased when it comes to eating out. We are not snobs, we like all kinds of food if it is well prepared and cooked..and fresh. When we do find a good meal it is a wondrous thing. We certainly found one at Burnt Enz in what was the Climpson's roastery in Hackney recently. They had built two custom built brick ovens outside with a BBQ grill. Dave the chef and team were serving some excellent food, quality ingredients served very simply. We ordered the roast suckling pig and a grilled lobster with aiolli and salad, it was so good. Yusuf only had one evening off so we made a 200 mile round trip to eat at Burnt Enz and it was more than worth it. I have eaten a lot of pig, all kinds of nose to tail pig, rare breed pig, not so rare breed pig, slow cooked pig, New York bacon, piggy confit, piggy feet, piggy nose and ears, piggy head, liver, heart you name it I have eaten it. The flesh was soft and almost buttery, and the cracking was light and crispy and delicious. Yusuf ordered the lobster next, he took advantage of my striking up conversation with a restauranteur also sat at our table and nearly polished off the whole thing while I was chatting. The lobster was dispatched just before it was cooked so it was VERY fresh, and very sweet and beautifully cooked. The restauranteur sat with us explained Nuno Mendes was sat in our seats just before we sat down, this was a pretty positive sign the food was going to be good. Yusuf and I have not eaten at Viajante, but we had a cocktail recently in the bar of The Town Hall Hotel in Bethnal Green and it was out of this world good. Burnt Enz were serving some great real micro brewery beers and cocktails, unfortunately I was driving so I missed out on the rather yummy looking espresso martini's. Shame! What I loved about his place, and about what is happening all over Hackney is that incongruous places, industrial units, railway arches, old car showrooms are turned into semi make shift venues, bars, cafes and restaurants. All usual formality is suspended and there is a laid back scruffy make shift style. No million pound makeovers, no chandeliers. Just awesome food and drinks. While we were at Burnt Enz we bumped into the lovely Leluu a fellow supper club runner, amidst many other talents. Leluu cooked for my hen party, the most delicious ten course Vietnamese feast which will always be a truly unforgettable memory. Leluu and I have a few things in common. We both set up supper clubs in 2009 with our partners, we both have a fashion/clothing design background, we both cook and take pictures and we are both Hackney girls so it was lovely to finally meet her properly and experience what she does, so very well. I thank my wonderful hens for reading my mind on that one. Amazing bunch of girls I have in my life. The hens, or as I named the The New Bridal Army gave me a surprise whirlwind tour of London on a black gothic routemaster bus full of margaritas, drag queens, disco, gay strippers and actual magic (a card trick that burst into flames inches from my face!..no idea?!). One of the surprise stops was Leluu's place in Hackney, my old stomping ground. She has a lovely home and is a fantastic cook and host, her Bo La Lot (beef in betel leaf) nearly made my sister cry with joy when she ate it. I kid you not. 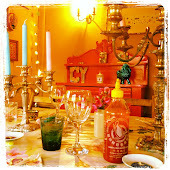 Leluu very sweetly said she would come to my first London supper club in Hackney on the 29th September, how exciting! It will be a pleasure to cook for her after such a joyous meal at her place. I do so hope I don't get stage fright and burn everything.. Spaces for my London supper club are very limited and are already almost full. Email me to make a booking.